Supposedly it keeps herbs fresh 3x longer. I found it at Sur la Table, and it was under $10. 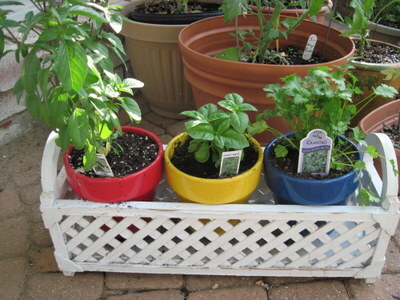 I want one ... although I started an herb garden on my porch. I'll have to take a picture of that. Bunnies (or someone) already snarfed my rosemary from my backyard. I wasn't sure where to post this...we need a cooking gadget board, haha! 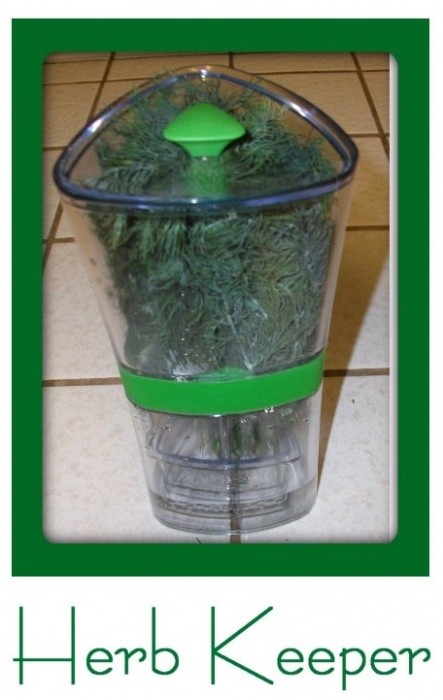 I love fun kitchen stuff...especially if it will keep my organic herbs from wilting before I can use them! Okay you guys, I already went to amazon earlier today to get an olive oil sprayer and now I need to go back and see what they have in the way of herb keepers. I am as bad with kitchen gadgets as I am with books! Cilantro and basil are wilting in my refrigerator and I am sure they would be happy if I got them an herb keeper. I think being "addicted" to gadgets that encourage healthier eating and using them to make eating healthier easier, is soooo much better than being addicted to or using unbeneficial foods! That's my opinion. I'm already asking for Sur la Table gift cards...I figure I need 4 more for my staple herbs, but then that would be an odd number, so one more as an extra for an occasional herb for a recipe that I usually don't have on hand. Uh-huh. That's my plan and I'm sticking to it! OH, and in reference to what Amber mentioned...I posted in my blog that I saw on Dr. Oz that you can take fresh herbs and freeze them in water (like ice cubes), and then transfer them to baggies, seal-a-meals, etc., because you cannot just freeze herbs or they will turn black...the ice preserves them wonderfully! haha KC. I was amazed to find out that now I can dump my Pam. Although I've been pretty much using coconut oil anyway instead. It's kindof like how when you realize you can clean everything with white vinegar that you see how much we "buy into" all the products and gimmicks. There are lots of old fashioned ways to do stuff without buying someone's product. Except their spritzers and herb keepers of course! Lisa, how big is that? Could you get that many on your counter? I guess you could just put a pot on your counter with the fresh herbs growing right there too! I was going to put them in my veggie refrigerator...but maybe I'm not supposed too, hahahah! Thanks Cindy! Does Whole Foods have them in a REFRIGERATOR?! DUH! I have a huge kitchen counter, so yes, but I also think I could stack them. They are about 9" tall and 5" wide. Guess they will go next to my avocado grow-ve! I'm going to have to start calling my kitchen a "hot house" or actually GET ONE! Oh, Costco! too. Been eyeing that one for awhile! Here's how I'm storing my herbs these days. So excited to have fresh cilantro around! Cinnamon basil, sweet basil and cilantro. I had a rosemary plant growing in a garden but the bunnies snatched it. this is best!!! Until I have the time to do a garden, I'm having a counter garden, hee hee! I'd go through that bunch of cilantro in a day! Here in S. Tx Cilantro is in abundance. I've noticed it for .28 cents a bunch but I have yet to cook with it myself. Sounds like I need to do some more experimenting. Lisa, how about a cilantro recipe challenge? I have not used it and would enjoy seeing some favorite recipes by SYDsters and SYDthers. @kc: That sounds like a fun challenge! I'm a bit involved in the cookbook recipe challenge at the moment...possibly when I get back from vacation, OR, you can start it, and I'd be glad to enter my favorite clean recipes that I make using it.